This post should really be titled, “MAD MAD MAD” respect. Respect for what, you may ask? For life-long astronauts? For scientists and support-staff who over-winter in Antarctica? For servicepeople aboard submarines and ships who do this isolation thing all the time? Absolutely, but I’ve respected the heck out of those folks for years. This is BRAND NEW respect we’re talking about here. Over the last two weeks – two weeks already! – I’ve come upon a PROFOUND pile of respect – basically a MOUNTAIN of respect – for people who feed families of 6 or more in underdeveloped countries. It’s an all-day-long, and half-the-night-long endeavor. I don’t know how anyone does it for weeks, months, YEARS on end. How did I miss this? In high school, I lived in a dorm with 12 other people, including two 18-year-old Japanese football players who individually – not collectively – consumed a lasagna, a loaf of garlic bread, and a green salad the size of a 6-month-old baby for dinner EVERY DAY. In college, I lived in a co-op with 40 other similarly talented consumers of food and makers of domestic chaos. Berkeley + lots of pillows + movie night + popcorn => a mess of epic proportions. Kernels continued to be found in every nook and cranny for weeks afterwards (especially when the movie is REAL GENIUS. I should have known better). In graduate school, I had a minimum of 3 roommates at all times, most of whom were European (99% bread, wine and products derived from olives by volume). Then it becomes obvious how I missed this. 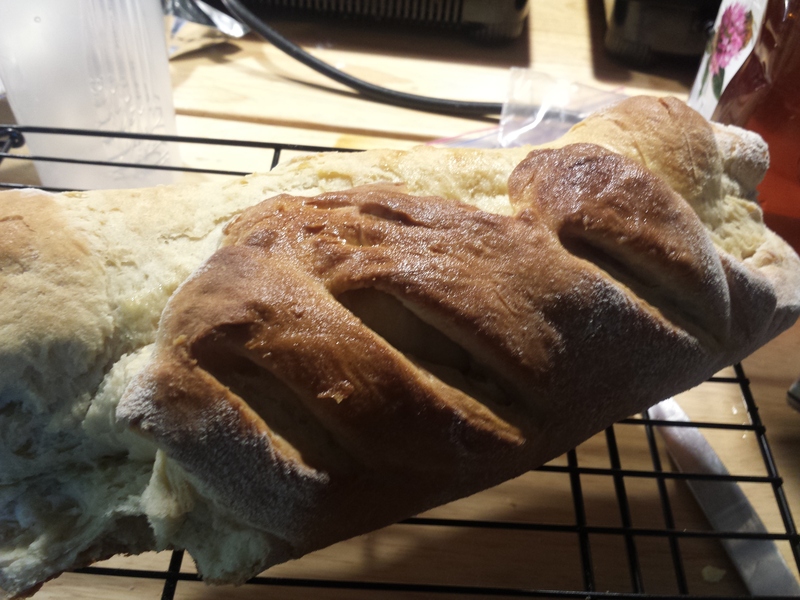 In grad school, I used to make a couple of loaves every week…in a bread machine. 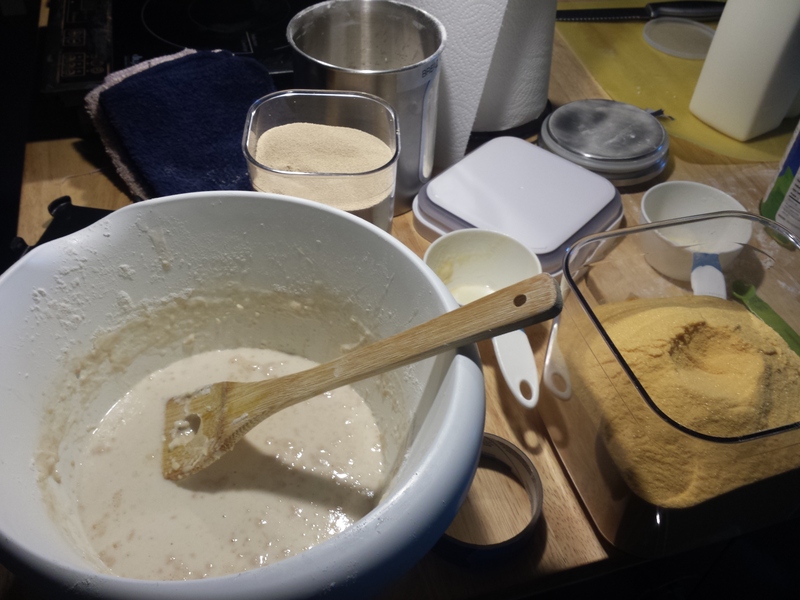 Here, I am making a loaf of bread A DAY, by hand. That is, after I, or another crew member, makes a liter of milk (long live Nido). Then, there’s the several rounds of yogurt culturing daily. Don’t get me start on the cheese. This crew likes their cheese (we may be 99% cheese by volume). Rationally speaking, I know that a group of six scientists ranging in age from their mid-twenty’s to their mid-thirty’s can’t possibly be eating as much as my roommates in high school and college. The difference here is that everything you want to put in your mouth, you have to make it first. That’s where the mad respect comes in. There’s no running to the corner bodega around here. If you want milk, you reach into the pantry for the powdered whole, you head to the kitchen island for a measuring cup, and you set to work. Once you have your milk nice and liquefied, you can think about making some bread. That’s assuming that you have a bread culture going, happy and bubbling away in a corner somewhere. Fortunately, we started ours shortly after the hatch closed. Our starter is a sourdough – milder than the San Francisco variety, a bit sweeter, and slightly more versatile. Also, after being fed and watered every day for two weeks, it is FUERTE. The starter – let’s call it Bob for short – began as a single packet the size of your thumb. Today, if you give it water, flour and something sweet to chew on (we use honey), Bob can grow into a puffy loaf the size of a football within an hour. …RESPECT. Mad mad mad respect. For the people who do this every single day of their lives. And also – for the food itself. Take yogurt as an example. A lot of us enjoy yogurt. Many of us are aware that under that cool white exterior, the creamy yogurt experience is powered by some very active little bugs. Our batch of yogurt bacteria are called Filmjolk. For ease, let’s call our yogurt culture Haans. When you nudge Haans from his slumber, feed him reconstituted whole milk and leave him somewhere nice and warm, in about 8 hours he hands you back a soft, vaguely sweet, mildly sour substance that turns into yogurt when you strain it through cheesecloth. In return for a cup and a half of milk, Haans (or, two tablespoons of him) will hand you back a little less than a quarter cup of Filmjolk. He’ll also smear himself all over a couple of bowls, a few spoons and a big square of cheesecloth, which you then have to scrub out. He’s a messy, messy guy. You are now cleaning up after him – after yourself and the crew, really – in exchange for what amounts to a few bites of yogurt. Mad, mad, MAD respect for people who make enough yogurt to feed their families. In truth, there are easier ways to do a lot of this stuff. You can culture yogurt in big batches, for example. All of that requires two things we don’t have a lot of: energy and living space. We don’t have a big fridge in which to store a quart of yogurt. We don’t have an oven than can bake 5 loaves at a time. We have a limited number of kW per day. We use most of those watts to keep the lights on, the water pumping, and the composting toilet fans running. GOD FORBID those toilet fans should quit (they blow the gases coming from our composting waste from wafting into the living space). So Haans lives in the warm corners of the hab during the day. At night, we place bowls of rising bread near our bunks so Bob can baste in our body heat and rise while we’re asleep. It’s like feeding an invisible garden with a watering can full of vigilance. We try to keep these little buggers alive, so that they can do the same for us in their turn. Neglegence means that the culture dies. No more bread. No more yogurt, until we grow another. This has already happened once. On a particularly cold night in the hab – we don’t have a lot of extra power for heat – a fromage blanc yogurt culture that had been left out to grow froze to death instead. It didn’t have a name. I’ve been camping before, many times. I lived on an island in the Caribbean for two years. During my time in Grenada, there was a terrible drought. Even with strict conservation, I had to choose which of my papaya trees to keep alive (there wasn’t enough water for all three). I wanted them all to make it, but in truth I didn’t need them to survive. Before the drought, and after, the women selling fruit at the corner stands used to beg me to bring them back the tops of the giant pineapples they would sell me for less than a dollar. The top is the root. They needed them for the next year’s crop. I would cut them off carefully, and return them quickly. I did that out of respect. This – this is the closest I’ve come to living on the edge. Take care of this or you don’t get bread. Take care of this or you don’t get yogurt or cheese. Of course, we could live without these things, in some mediocre sense, for the next year. We have enough dried beans and vitamins to survive until next August. It won’t go well, though, and neither will we. By volume, each of us is more bacteria than human cells. Many of those are in your digestive track, and they are used to a certain way of life. To do more than just survive, to thrive and function at our highest potential, we need to consume food that’s alive, too. Nothing out here on the lava fields is alive unless we’ve brought it to life and kept it that way. Looking back over history, most of humanity was born into this circumstance. The daily reality of needing to keep food alive dictated their days, their nights, their entire lives. A year from now, if I wish, I can go back to buying 4 oz of Yoplait for 99 cents. I can take advantage of someone else’s vigilance – pay them for keeping the food alive until I’m ready to eat it. The ability to pass an entire lifetime paying someone else to keep the food alive so recent a phenomenon that it’s almost breathtaking. A hundred years ago, it wasn’t a choice for most people. It’s now the default for nearly everyone in modern society. Here’s what our mission highlights: In ultramodern society, when we head out to the stars, we’ll be going back to living on the edge. The cultures we have here making the food that keeps us alive and healthy – Bob and Haans and all the others – weighed merely ounces on the day we launched. Since then, they have turned out pounds of edible food. As living things we’re dependent upon, we’ll have to care about them and for them in ways most of the people reading this have never cared about food. We’ve all enjoyed food. A few times, the food in front of us has been so darn good it was a transportive experience. At the edges of life, bread, simple bread, a living thing and a staple of human existence, invokes so much respect that it earns itself a name.